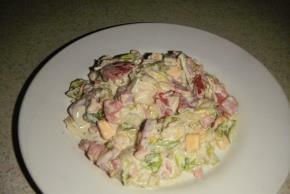 In large salad bowl mix chopped lettuce, tomatoes, onions, cheese, bacon bits. Crumble in crackers. Add Real Mayo. Stir into salad evenly. Slowly add Greek Seasoning, mix well. Eat now or chill for later.